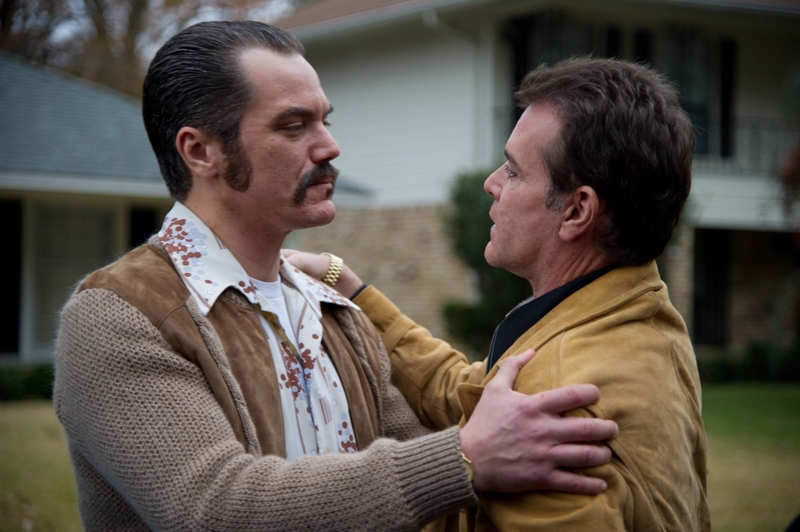 Michael Shannon and Ray Liotta in ‘The Iceman’. The Iceman is a striking look into the camaraderie and code of ethics of this specific branch of documented killers. In a place where toughness and machismo are acknowledged solely by reputation and known affiliates, one man attempts to quiet his inner turmoil in as healthy of an outlet as his neighborhood allows. Michael Shannon is The Iceman, Richard Kuklinski. He is the strong, silent type among the loud and convincing. Like so many others in his neighborhood, on the surface his life is quite good. Richard is happily married and a devoted father to his children. His work allows him to live a comfortable life in a beautiful home. His family enjoys the perks of the best school in the most respectable area of town. Underneath the surface is the truth of his temperament and the source of his income. Richard Kuklinski is a notorious hitman for Roy Demeo as played by Ray Liotta. After several years of an amicable working partnership, friction within the syndicate drives a wedge between associates. Richard’s secret, once kept as privileged information amongst wise guys, is exposed, and every decision leading up to it is revisited in this account of his life. The Iceman is grim, though it manages to tell a dark story without ever succumbing to the gore of its subject matter. Michael Shannon possesses a conviction that allows him depth and mystery even when taking a breath or exhaling. The slicked-back hair and eastern dialect of New York’s Mafioso secure him as an imposing character and person of interest. It was in 1992 that filmmaker Ariel Vromen first learned of Richard Kuklinski through James Thebaut’s documentary, The Iceman: Confessions of a Cold-Blooded Killer. Vromen teamed with writing partner Morgan Land and penned the screenplay The Iceman. Years later, a test scene for YouTube received 200,000 views and reignited Vromen’s desire to bring the inside story of Richard Kuklinski to the silver screen. Then, still practically unknown, Shannon was deemed as the only man who could do justice to The Iceman. Vromen had long been a fan of the actor’s work, and once the interest in the screenplay had become an Internet success he was able to secure producers to start filming which began in December 2011. The film wrapped in April of 2012 after an exhilarating shoot which took place primarily in Shreveport, Louisiana. Audiences can rest assured, cast and crew held true to the Jersey core of the central story and enjoyed an intoxicating last day of filming in New York. The film is set in America and begins in the middle of the 1960s with a media frenzied conclusion in 1986, the year of Kuklinski’s arrest. Much consideration is given to the events that lead what seems to be a confident and mild-mannered young man down the road of infamy as a contract killer for the mob. Richard Kuklinski is a mystery and a contradiction. This is countered by the delicate nature of his unsuspecting wife, Deborah. Each member of the cast is equally matched to the specific character portrayed. The sum total of dynamism and accuracy is humbled before impact and will not be missed by audiences. Ray Liotta is spot-on as Roy Demeo. While David Schwimmer is perfect as Demeo’s beta, Josh Rosenthal. Chris Evans is fantastic as the notorious Mr. Freezy. Finally, Winona Ryder allows Deborah Pellicotti a sweetness that is almost painful. The Iceman reveals how a mass murderer by day negotiated his home life by night. This film is based on actual events and designed for mature audiences. It is a nail biting, breath-holding sigh of relief that never really arrives on time. Do not enjoy this film alone; it’s an experience meant to be shared.